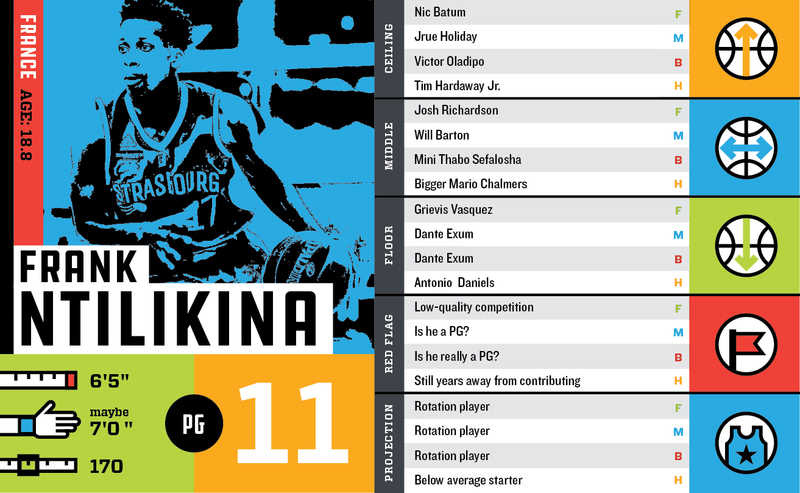 Welcome to the third installment of the Dancing with Noah 2017 NBA Draft player analysis featuring players ranked 11 to 15 from our big board. Players one through five and six through ten have been covered already. This round covers Frank Ntilikina, Donovan Mitchell, Luke Kennard, OG Anunoby, and Justin Patton. And as the guy who wrote three of the scouting reports/analyses below, it’s crazy how quickly the quality of prospect shifts from semi-definition to mere outlines and visions based on potential. And it’s not to say none of the top-10 players are “specialists,” but as we shift lower, it seems some of these players have obvious specialty skills offset by weaknesses that lower their ceilings relative to players in the top-10. And as always, special thanks to my fellow writers Hamilton and Bug, and our talented designer, Maahs. The only tape I’ve seen of Ntilikina (a difficult name to spell) is against teens in an U-18 European tournament. It’s nigh impossible to comprehend how skills translate from the high school or low-pro level to the NBA or how a 6’5” point guard with monster length translates. In some regards, I imagine this is how scouts felt in the late 1990s and early 2000s watching the likes of Eddy Curry feasting and beasting on 6’4” centers at the high school level. Enough about Curry though. Ntilikina is super long with a balanced, if slow, catch and shoot jumper. His motion is consistent as he gets square and has strong balance. As that jumper is presently constituted, I don’t see him getting clean looks in the NBA unless he’s able to speed up his release – which he showed on occasion. In the limited tape I viewed, I didn’t see a ton of footspeed quickness; particularly on the offensive end. However, most scouting reports which point to the defensive end as his greatest strength call out lateral quickness. With an unofficial wingspan near seven-feet, there’s potential to be a damn hellion on that end of the floor. This type of scouting report is applicable to a lot of youngsters as the skill-side hasn’t caught up with their physical gifts. Anunoby, Isaac, and Anigbogu come to mind. Also, there’s no guarantee the skill side does catch up. I do wonder if he’s really a point guard or if he’ll slot into a combo guard capable of switching onto multiple positions at the NBA level. Bug compared him to a mini version of Thabo Sefolosha and I’m apt to agree with him though I may take it even a step further and extend a high-end comparison to Nicolas Batum. Both players are smart, with defensive versatility and offensive games better-suited as second or third (or further down) options. Even with that all that defensive potential, I don’t think you draft Ntilikina with the expectation of immediate returns. He’s one of the younger players in this class and while he may be somewhat ready to make plays on the defensive end, the offensive side of the ball is going to take time to develop. If he’s entering his fourth season as a 22-year-old and he hasn’t ascended to starter-level, will a team still be invested? Will he maintain his confidence? These types of variable scenarios are realistic and will shape how adapts to the NBA over time. 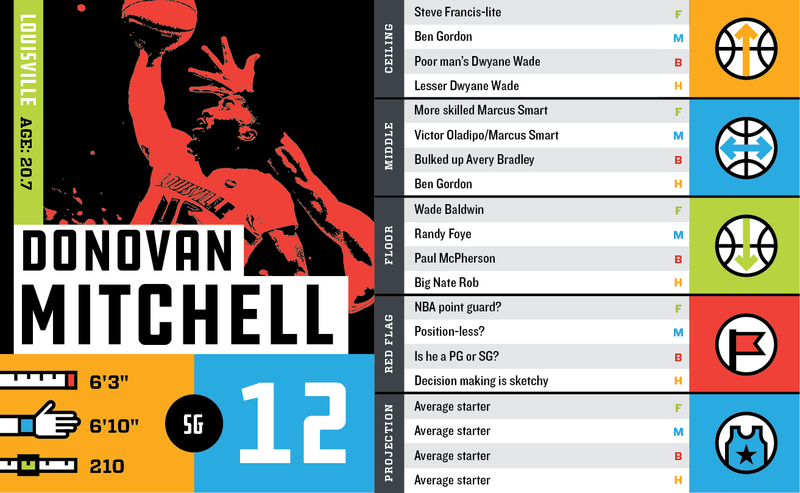 To be quite honest, I didn’t see much Donovan Mitchell during the 2016-17 season. After watching some of his tape, I wish I had paid closer attention because he’s fun to watch. He’s fast (fastest ¾ court combine sprint since 2009), shifty, long-armed, and has incredible leaping ability. Anyone who has played JUCO ball knows this player type … It’s highly unlikely he makes it to Dwyane Wade’s level, but Wade has developed the template for the smallish slash-first scorer with supreme athletic ability in the modern NBA. Mitchell appears to be a better three-point shooter than Wade was coming out of Marquette and that’s a good thing for him because he isn’t quite as big. He gets his shots off above and around bigger defenders and can make tough ones. His sturdy build along with great two-footed leaping and long arms should help him on drives and finishes in the NBA as well. He protects and hides the ball on drives using long strides and impressive body control to get to his spot. This is where he most reminds me of Wade. On the downside, he appears to settle for jump shots a lot. Probably won’t ever be much of a PG. Not a great one-foot leaper, which will be somewhat limiting against NBA size. He looks awkward driving to his left and going up off one foot. Talented enough to be a top player from this class, Mitchell projects as a starter on a bad team or a 2nd unit scorer on a good one. He plays with a flair that reminds of J.R. Smith, Nate Robinson or Nick Young. He’ll do some things that make you cringe and just as easily wow you on the next possession. And that’s what you live with when you have guys like JR, Nate Rob or Swaggy P. He is cut from their cloth. Irrational confidence. Pull-up 3s in transition. Highlight reel shot-making. 20+ points on any given night. Equally likely to be a total no-show. 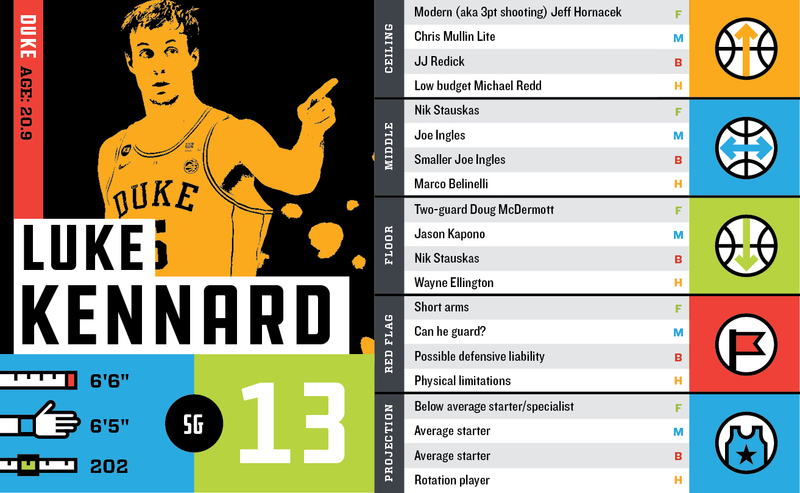 Going into my analysis of Luke Kennard, I tried to keep an open mind as far as player comparisons go. I didn’t want to take the easy way out and compare him to fellow Duke alum J.J. Redick, but the more I watched Kennard, the more I saw a lot of the tools that make Redick successful in the NBA. The similarities go deeper than them being white guys from Duke that are elite shooters. Both players have wingspans that are shorter than their height, which can make it harder to get shots off in the paint and off-the-dribble. Looking back at Redick’s Draft Express profile from 2006, they also had a lot of the same weaknesses and concerns coming into the draft. 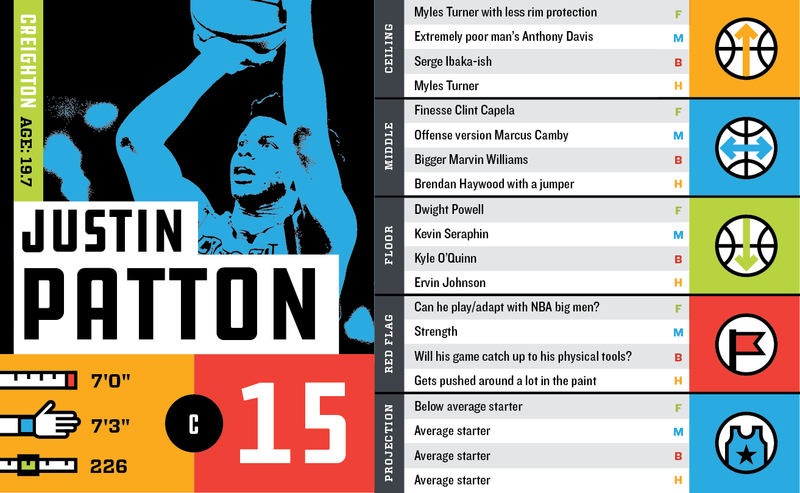 Does he have enough athleticism to be able to guard NBA players? Is he explosive enough to get to the rim, and when he does get in the paint, will the lack of length make it tough on him to score? These are all legitimate concerns, but Redick has given players with Kennard’s skill-set a blueprint to succeed in the NBA. He’s not going to be a franchise guy and #1 scorer for a team, but he can carve out a role on a team to help provide shooting and spacing, which is huge for the giving primary scorers room to operate. He made a huge leap from his freshman to sophomore seasons. He went from 12-points on 32% three-point shooting to the second-leading scorer in the ACC at 19.5 points with 53-44-86 shooting percentages. The thing that jumps out to me when I watch Kennard’s tape from Duke is his basketball IQ and an extremely advanced triple threat, face up game. As noted earlier, Kennard doesn’t have overwhelming athleticism, but he makes up for it with crafty moves off shot fakes, step backs and pull-ups. His deadly jumper sets up his offense because the defense is forced to respect his shot. He plays within himself most of the time, and doesn’t try to make plays outside of his capabilities. His 1.6 turnovers-per-game is outstanding for a player that was asked to carry a lot of the offensive load for his team. Overall, I think Kennard is a very good late lottery prospect that can help out a team that needs shooting. In today’s NBA with smaller lineups and less low post banging, a team can never have enough shooting. Not only will the team drafting him be getting a great shooter, they will also be getting a good basketball player that knows how to play the game with great pace and intelligence. 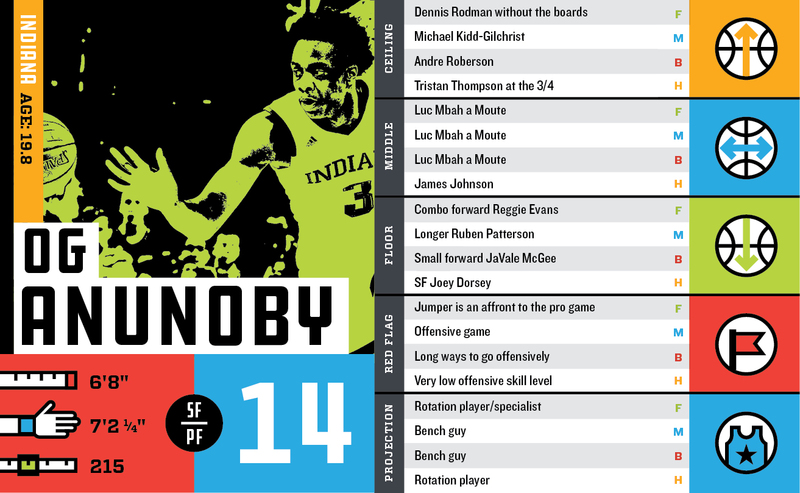 While he appeared in just 16 games as a sophomore at Indiana due to what was reported as an ACL tear, Anunoby averaged over two blocks and two steals per-40 minutes. I don’t see him as some kind of Andrei Kirilenko defensive wunderkind, but the ceiling for his defensive impact is significant. Not to take away from his work ethic, but it helps to be built like a long pterodactyl-like wings. Now to the bad: OG can’t shoot. He shot just 52% from the line for his college career and after nearly 45% from three as a freshman on just under one attempt-per-game, that number dropped to 31% on nearly three attempts as a sophomore. It’s not just that the percentages are bad, but his form and release are awful. His footwork is poor and even when the shot goes in, I find myself cringing. I saw no evidence of playmaking. I tend to downplay the 45% he shot from three as a freshman because the mechanics are so poor. His shooting has scared me into seeing his offensive floor maybe a level above Dennis Rodman’s – which is just horrendous. He can absolutely evolve offensively, but he doesn’t look like he’ll ever be even a top-four option on offense. Coupled with the lack of playmaking and it’s enough to land him in the specialist category which isn’t the worst place to be as a 6’8” combo-forward who can potentially defend all five positions. Justin Patton, Harry Giles, Jonathan Isaac, Zach Collins, John Collins, Jarrett Allen, Ike Anigbogu. Who are these young, athletic giants roaming college and high school campuses across the United States? I watched their tapes, read their scouting reports and they’re all unique as snowflakes, complete with their own bags of strengths and weaknesses, idiosyncrasies and TBD-futures. Patton lands right in the middle of this batch; a nearly seven-foot red-shirt freshman from Creighton where he shot a ridiculous 67% from the field on 13 attempts-per-game. Per Draft Express and Synergy, that number kicked up to 75% around the rim. Those shots around the basket accounted for 77% of his total field goal attempts. 174 of his 200 makes came at the rim. This is on some DeAndre Jordan distribution. But Patton is no Jordan; in both good and bad ways. He can hit the jumper as he was able to make eight threes on just 15 attempts. His mechanics are funky though and he shot just 52% from the line. In short, there are no guarantees. And that’s the good on the Jordan comparison. The bad is that he doesn’t rebound anything like DeAndre; not even Texas A&M, raw, unpolished DJ. Where DJ averaged nearly 12-rebounds-per-40 as a freshman, Patton averaged less-than-ten. His per-40 rebounding average is lower than any of the bigs included on this big board. His rebounding rate (under 14%) was 81st in the country – for freshmen. If he’s not ready to be a reliable jump shooter, with his current defensive ability (good lateral movement, but questionable technique), he’s a five-man in the NBA. And if he’s a center, then he has to be better as a rebounder. Patton doesn’t have to be DJ anymore than Isaac has to be Kevin Garnett. But unless he’s able to maintain his efficiency from three at the NBA level or proves he can sharpen his defensive technique, then he’ll be a rotation player. Or, if his copious physical gifts (7’3” wingspan, nearly 31” vertical at just a hair under seven-feet) and skills reach their potential, then he’s a guy who can impact the game on both sides of the ball. The same can be said of most of these big guys. The art for scouts and front offices is figuring out who has the desire and will to be better and then putting them in a position where they can grow at a pace that’s both natural and challenging. If it was easy, everyone would do it.